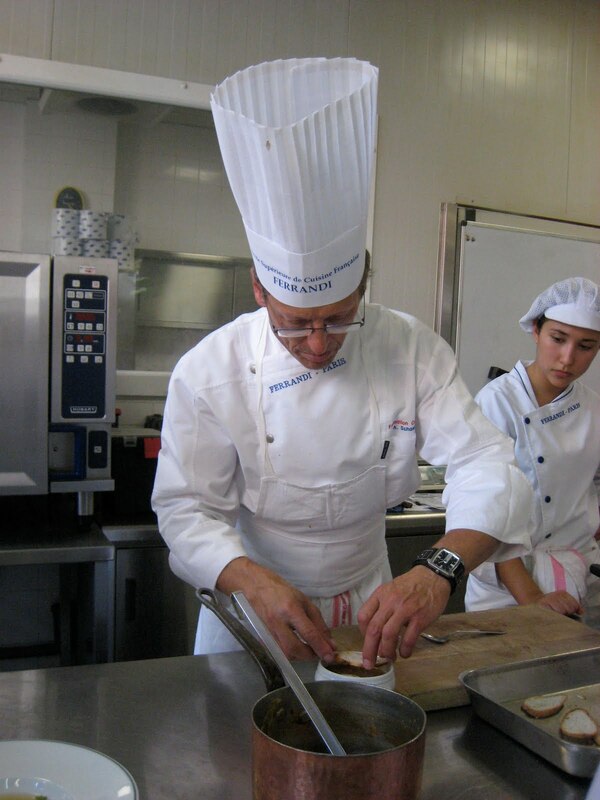 As the 3rd week is coming to an end, we’re getting closer to Friday and Le Menu Provençale. Every other friday, our group will be cooking a 6-course lunch (accompanied by wine) and we’ll sit down altogether and eat after we cook and place all the dishes. I’ll put up the menu and photos of it tomorrow but am excited to eat lots of fish, meat and desserts inspired by the Provence region! In the meantime, we’ve made more complex soups this week; and I have loved all of them. First, Crème Agnès Sorel (our Chef said that whenever Agnès Sorel’s name comes along, it has to do something with mushrooms); so basically it’s cream of mushroom soup – one of my top faves soups ever! 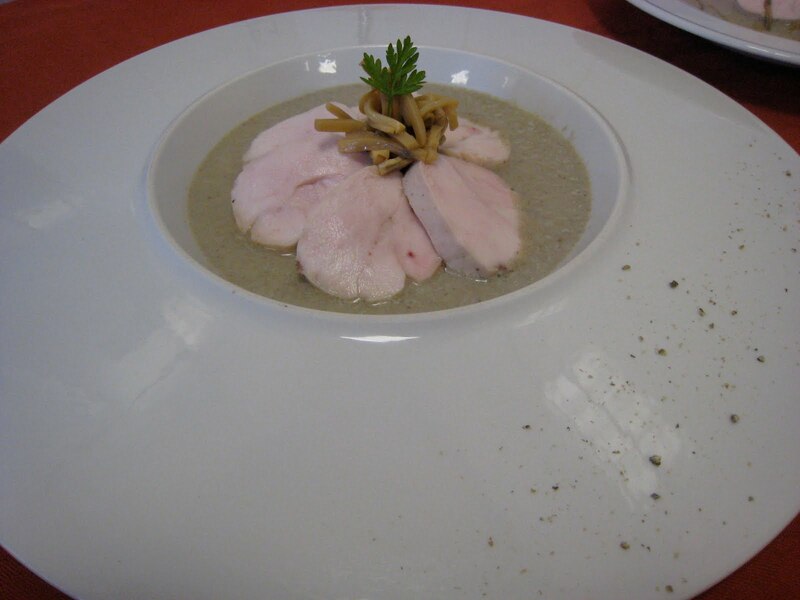 To add a little twist, we rolled some chicken breast in clear film and steamed it, sliced it and presented it as the center-piece of the soup, along with some sauteed mushrooms. 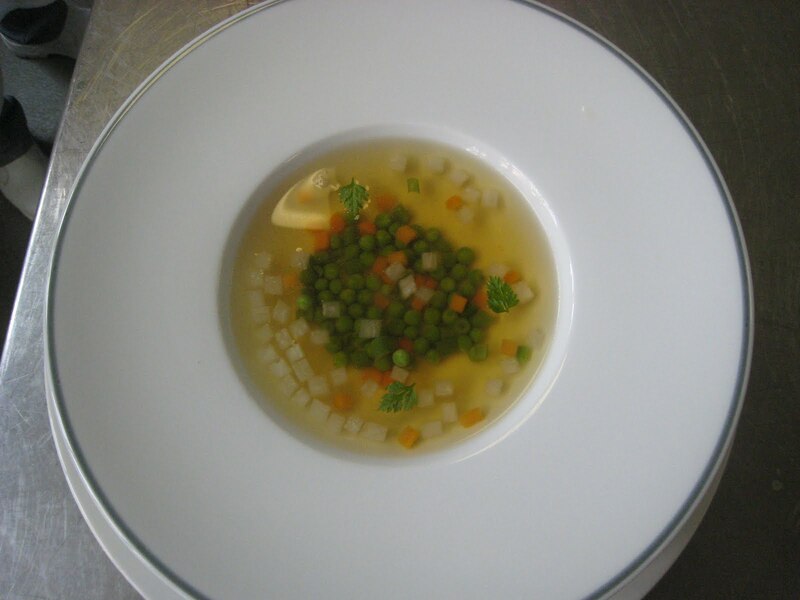 Next, we did Consommé Brunoise. Now, it might not seem very complex, but I assure it, it takes many house, even an overnight process to get a very clear and transparent Consommé (a clear soup made from rich stock). First, you must immerse the veal bones (shanks, ox tail, rib) in water; then degrease and take out the fat that floats up top, cut and throw in carottes, roasted oignons, garlic, leek and let it simmer for 4-6 hours (at least!). This is a Marmite. Then take out all the liquid and preserve it in a fridge. The next day, we reheated it and had to do the clarification process (a fining process using protein) for it to become a Consommé. In a separate bowl, you must put in 1-2 egg whites, beat it for a couple of seconds, add in some raw vegetables and minced meat, mix it altogether and slowly add the brown liquid from the Marmite. The clarification process has to be exact, it cannot be too little or too much. Put it in a saucepan and what should happen is that the meat should be rising on top of the liquid. You have to let it sit for 30 minutes and what should happen is that it makes an opening within the liquid to a finer liquid (the Consommé), that is obviously strained beforehand. End process below, it really tasted great! 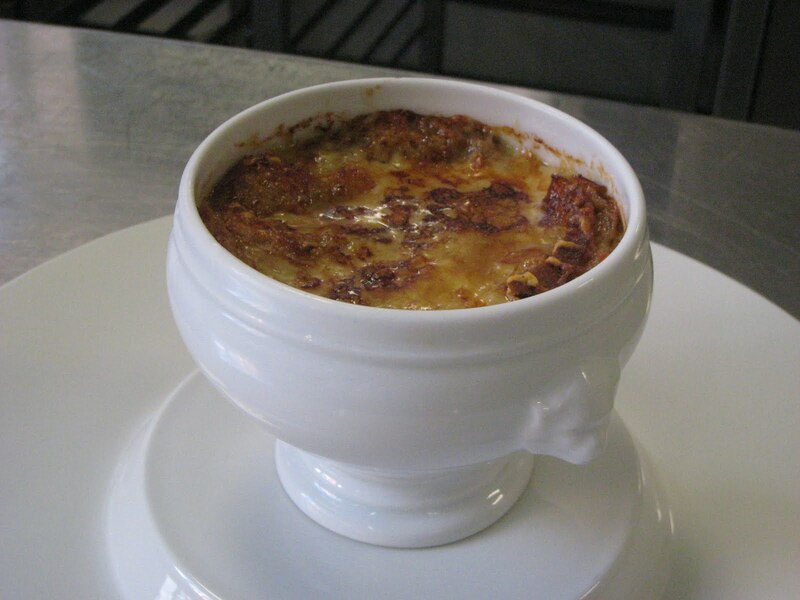 Finally, we did the famous Soupe à l’Oignon, a classic French soup; using oignons (of course), sweated in butter until golden brown, with which is added the Marmite liquid (from the latter dish). Some chefs put flour beforehand, but it’s really a personal choice. 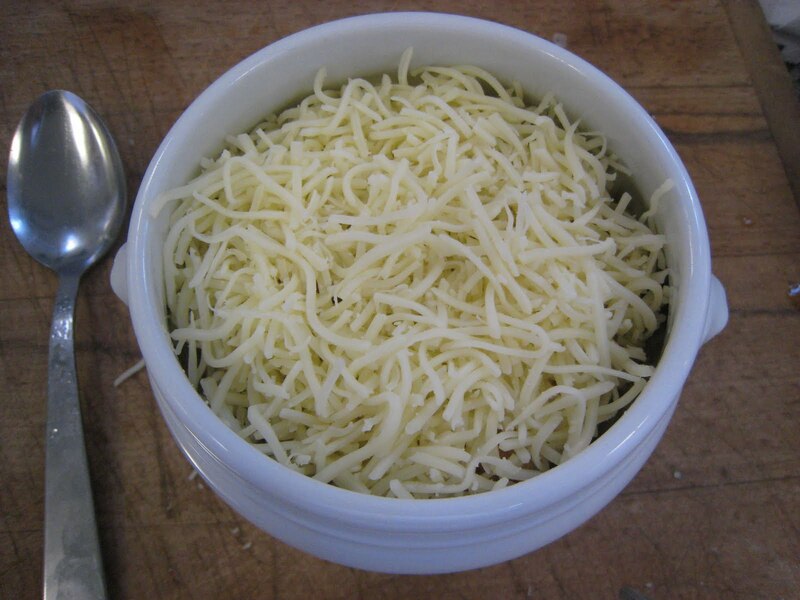 Then we pour it into a traditional oignon soup bowl, grill some baguette slices (2-3 is enough), place them on top unilaterally, add A LOT of gruyère cheese and pop it into the oven, then the salamander for a heating of the top. Before putting it in the grill! Im not usually too big on soups, but mmmmm, I'd go for that very last one! Looks brilliant. Save me some? KThanks.